This intimate, in-depth look at Beyoncé's celebrated 2018 Coachella performance reveals the emotional road from creative concept to cultural movement. Premiering April 17. Only on Netflix. Last week, a rumor started to circulate regarding a possible Beyoncé documentary making its way to Netflix. Sources close to the singer also indicated that she's been in the studio working on some new music, but it's currently unclear if there's a follow-up to Lemonade on the way anytime soon. However, it's starting to look as though the first part of the rumor might be true after all, as Netflix has sent the Beyhive into a frenzy with a simple tweet. Netflix teased a project entitled Homecoming on their social media accounts. While there's no more information besides an April 17 release date, fans immediately connected the font and color theme in the teaser image with that of Beyoncé's Coachella 2018 merch. While it's not exactly a confirmation, it's starting to look very likely that fans will be getting a behind-the-scenes look at Bey's legendary set at the 2018 festival. Sources did state that the documentary would "be tied to her Coachella 2018 performance" and will feature unspecified additional footage. Regardless, we won't have to wait much longer to find out what Homecoming has in store. Beyonce shared more photos from her trip to India. Beyonce shared her thoughts on the Global Citizen Festival and more photos from South Africa on Instagram. "After settling in at home from a beautiful trip to South Africa and India, I am still in awe that 7.1 BILLION dollars was raised to aid Global Citizen in its efforts to eradicate extreme poverty. I’d like to give my praise and respect to all the speakers, performers, and volunteers who donated their time to contribute to making positive change. Every person in the audience at FNB Stadium earned a seat because they generously donated their time to help their community. Now their efforts and the money raised will help improve education, healthcare, sanitation, women’s rights, and countless other causes for millions across the globe. I felt so much positivity and pride in the audience at Global Citizen: Mandela 100. Madiba, Johannesburg, and all of my African sisters and brothers, we hope we made you as proud as you all make us. South Africa was an extraordinary trip for me and my family. God bless. If you would like to become a Global Citizen you can get more info at globalcitizen.org"
"Thank you to the talented African designers who kept me feeling fresh. Y’all go so hard. "
Beyonce performed at Isha Ambani and Anand Piramal's pre-wedding party in India today. Beyonce shared new photos from South Africa. UPDATE: She posted even more photos. Beyonce.com was updated with photos from the rehearsals for the Global Citizen Festival performance. Last night Beyonce and Jay-Z performed during the Global Citizen Festival: Mandela 100 at FNB Stadium in Johannesburg, South Africa. The couple was joined on stage by Pharrell Williams and Ed Sheeran. In an effort to keep their performance exclusive for those who have earned their tickets to attend the Global Citizen Festival on Sunday 2 December, Beyonce and Jay Z have restricted the broadcasting of their set. Those watching the show via SABC, DSTV or the YouTube live stream will only be able to see the first 25 minutes of their performance. Everything else will be broadcast on DSTV’s pop up channel 199 throughout the day. There will be repeats of the concert and the additional shows on DStv channel 199 on Monday 3, Tuesday 4, and Wednesday 5 of December. I uploaded some older photos that were missing from our gallery. Just before inviting the audience to sing along with her at Thursday’s City of Hope Spirit of Life gala, Beyoncé, fresh from her On the Run II tour with husband Jay-Z, had a few words to say to Warner/Chappell Music Chairman and Chief Executive Jon Platt, the night’s honoree. “There’s something about winning an Ebay auction that’s just so exciting,” says stylist Mariel Haenn, one half of the power duo, known as Rob and Mariel, that’s responsible for J.Lo’s glamorous, high-wattage looks. “Agreed,” says her business partner Rob Zangardi. “That cha-ching notification always gives me a thrill.” Even more so, perhaps, if you have just won the yellow Michael Costello jumpsuit worn by Lopez at the 2015 AMAs, or a pair of Justin Bieber’s quilted leather Balmain skate shoes, or one of Kendall Jenner’s Adidas sweatsuits from her collaboration with Daniëlle Cathari, which are just some of the items that eBay will auction on the site’s first-ever Fall Stylist Sale running from September 25th though October 2nd. The sale, which is part of the Ebay For Charity initiative, involves a team of top-tier celebrity stylists including Marni Senofonte (whose has dressed Lauryn Hill, Beyoncé, and Kendall Jenner); Karla Welch (best known perhaps for her teen-idol clients Justin Bieber and Lorde); Ilaria Urbinati (who outfits leading men like Donald Glover, Rami Malek, and Armie Hammer and the aforementioned Rob and Mariel to curate pieces from their archives for an auction to benefit the cause of their choice. The result is a collection over 50 pieces ranging from jewelry, bags, and shoes to sold-out collectibles and one-of-a-kind custom pieces by designers including Gucci, Valentino, Balenciaga, Jimmy Choo, and Balmain, many of which have walked the red carpet. Prices will start at 99 cents, and the lots will be featured on each of the stylists’ Instagram stories beginning today , allowing shoppers to swipe up and place bids on eBay. Here, a first look at some of the most covetable pieces that will go under the hammer. It was announced today that global icon Beyoncé will perform at the City of Hope gala on October 11 in Los Angeles. This will mark her first solo performance following the successful run of the biggest tour of the summer, with JAY-Z. OTRII stadium tour started in Cardiff, UK in June and is scheduled to wrap on October 4 in Seattle, Washington. Inspired by the guiding humanitarian principles of City of Hope and motivated by the institution's commitment to innovative medical research and compassionate patient care, a group of key industry executives founded the charity’s Music, Film and Entertainment Industry Group in 1973. In its 45-year history, the group has raised more than $118 million for City of Hope and has honored some of the most important figures in the music and entertainment industry. Beyonce, Jay-Z and Ed Sheeran will headline a special Global Citizen Festival in honor of Nelson Mandela in South Africa on Dec. 2. The concert, which will be held at FNB Stadium in Johannesburg, will mark the 100th anniversary of the birth of the anti-apartheid leader and Nobel Peace Prize winner, organizers announced early Monday. Mandela died in 2013. Others performing at the festival include Usher, Eddie Vedder, a joint set from Pharrell Williams and Coldplay’s Chris Martin, and African artists including Wizkid, Cassper Nyovest and Femi Kuti. Jay Z's Tidal is ready to make a splash in the live music space. The streaming service is gearing up for its first-ever concert event, dubbed TIDAL X: 1020, with an all-star lineup of more than 17 artists including Beyonce, Jay Z, Nicki Minaj, Usher, Prince, Lil Wayne, T.I., Fabolous, Damien Marley, Thomas Rhett and more. The event is set for Oct. 20 at Barclays Center in Brooklyn, New York. Tickets, which will range from $74 to $244, will go on sale for Tidal members on Wednesday, Sept. 30 at 12 p.m. ET, and for the general public on Friday, Oct. 2 at 12 p.m. ET. All funds collected from ticket sales will be administered by New World Foundation on behalf of Tidal. According to the organization's website, New World Foundation builds partnerships with philanthropic allies who "value the essential truth that the people who suffer injustice are crucial to overcoming it." An insider at the event echoes that all proceeds will "benefit nonprofit organizations dedicated to advancing positive community relations and effecting systemic change for the development and sustainability of just societies, this inaugural event's philanthropic focus." Fans who can't make it to the show in Brooklyn will be able to watch the whole thing streaming live on Tidal, for both members and non-members of the service, free of charge -- though viewers can make donations while watching the livestream. A look behind the scenes at the making of Made In America and Global Citizen Festival shows. Watch the full video on TIDAL. In the gallery you'll find pictures from the rehearsals for the Global Citizen Festival. Beyonce also had a soundcheck the day before the festival. Watch photos and videos on Instagram: 1, 2, 3, 4, 5, 6, 7, 8, 9, 10. Beyonce performed yesterday at the 2015 Global Citizen Festival in Central Park in New York City. I updated the gallery with various old photos. Win VIP tickets and M&G for Global Citizen Festival! Take action today and you'll be entered to win a pair of VIP tickets plus a 'Meet and Greet' with Beyoncé at the Global Citizen Festival in New York City on September 26! "As the co-founder of Chime for Change I am committed to fighting for issues facing girls and women all over the world. Take action now to empower girls and women by providing them access to clean water, sanitation, and hygiene. You'll be entered to win a pair of VIP tickets to the #GlobalCitizen Festival, and a chance to win a meet and greet!" Go to globalcitizen.org for more information. Beyonce.com was updated with photos from the rehearsals for the Made In America Festival. Yesterday Beyonce performed at the 2015 Budweiser Made in America Festival at Benjamin Franklin Parkway in Philadelphia, Pennsylvania. A new Beyonce T-shirt was being sold at the festival, see it here: 1, 2, 3. To see the full setlist, click "read more". The Tidal livestream from the Made In America Festival is available for free! Watch below. Beyonce is set to perform at 10:30PM. Check out a few short clips of Beyonce rehearsing "7/11" and the 2014 remix of "Crazy in Love" for the Made In America Festival tonight! In the gallery you'll find new photos from various appearances, performances, interviews, photoshoots and more! Budweiser Made In America Festival, founded by Jay Z, will be taking over Philadelphia this Labor Day Weekend with performances from Beyonce, Axwell & Ingrosso, Bassnectar, Cedric Gervais, Banks and more. Select performances from the highly-anticipated two-date festival will be exclusively live-streamed via TIDAL. The live feed will begin on Saturday, September 5 and Sunday, September 6 at 1:30 p.m. Jay Z’s event will also feature TIDAL Rising and TIDAL Discovery Artists on the festival’s TIDAL Stage. Meet Beyonce at the Global Citizen Festival! The 2015 Global Citizen Festival is on September 26th in New York City’s Central Park. Pearl Jam, Beyonce, Coldplay, and Ed Sheeran will headline this year’s music festival. The concert is the flagship event for the United Nations’ Global Poverty Project, which campaigns to eradicate extreme poverty by the year 2030. Now, thanks to Charitybuzz, you and your guest have a chance to meet Beyonce with two Premier Global VIP tickets to the Global Citizen Festival. The concert will be hosted by Stephen Colbert, Salma Hayek Pinault, Deborra-lee & Hugh Jackman, Kerry Washington & Olivia Wilde. You just have to place your bid until Thu, 10 Sep 2015 3:14:00 PM EDT and you’ll be part of one of the most significant events in music history! The current bid is $9,500, while the estimated value of this special offer is $40,000. So, hurry up! Beyonce's stylist Ty Hunter was spotted recently carrying out a style board from the singer's office. The board contains song titles and costume sketches, which will most likely be used during Beyonce's upcoming festival performances! Remember where you heard it first! Beyonce, Pearl Jam, Ed Sheeran and Coldplay will headline the 2015 Global Citizen Festival, a free-ticketed event on the Great Lawn in Central Park in New York City on Saturday, September 26, 2015. The Festival is timed to coincide with the launch of the United Nations' new Global Goals designed to fight inequality, protect our planet and end extreme poverty by 2030. The Global Citizen Festival will channel the power of hundreds of thousands of global citizens lending their voices to achieve policy and financial commitments that will shape the success of these Goals. msnbc will serve as a media partner of the Global Citizen Festival for the second year in a row. The network will air a live simulcast of the full concert on msnbc and msnbc.com. The Festival will be produced by Emmy Award-winning producer, Ken Ehrlich (Grammy Awards). Academy Award-nominated screenwriter Richard Curtis (Bridget Jones's Diary, Love Actually) will produce a one-hour special of the event to air on NBC on Sunday, September 27 and BBC One in the UK on Monday, September 28. BBC Worldwide will serve as the global distributor for the TV special. YouTube is a worldwide digital streaming partner for the Festival and will feature a special livestream of the full concert at YouTube.com/GlobalCitizen, presented by T-Mobile. iHeartRadio will digitally stream the audio of the Festival on iHeartRadio.com and in their app. TIDAL, the innovative music and entertainment platform, will also digitally stream the audio of the Festival on Tidal.com as well as in their app. Radio Everyone, the global pop up radio station, as part of the Global Goals campaign will then air highlights of the concert around the globe. Beyonce to perform at the 2015 Global Citizen Festival? We got an exclusive tip that Beyonce is going to perform at the 2015 Global Citizen Festival, which will be held on September 26 on the Great Lawn in New York City. The singer will perform alongside Ed Sheeran, Coldplay and Pearl Jam. The news is supposed to be announced on Thursday so we'll have to wait until then for the official confirmation. If you want to use this information, please credit BeyonceOnline.org. Beyoncé and the Weeknd will headline the lineup for Jay Z's fourth annual Budweiser Made in America festival, which will return to Philadelphia the Labor Day weekend of September 5th. Also on board to perform at the fest are J. Cole, De La Soul, Axwell & Ingrosso, Nick Jonas, Bassnectar, Big Sean, Earl Sweatshirt, Meek Mill, Banks, Vic Mensa, Santigold and more. A ticket pre-sale for the festival starts Thursday, June 25th at 10:00 am EDT at www.ticketmaster.com. The general public can purchase their tickets on Monday, June 29th at 12:00 p.m. EDT. 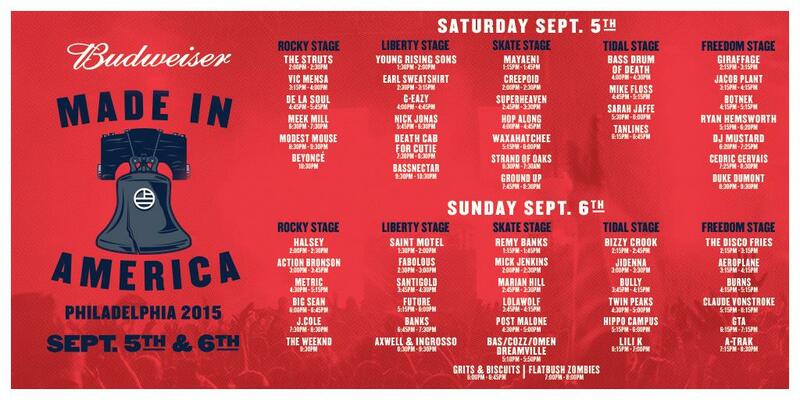 This is the first year that the Made in America fest doesn't have a rock act in a headlining slot. While all genres of music are represented, the 2015 lineup leans heavily on hip-hop and R&B. However, plenty of rockers will still take the stage at the Benjamin Franklin Parkway, including Modest Mouse, Death Cab for Cutie, Metric, Waxahatchee and Strands of Oak. The Made in America performance marks Beyoncé's second time headlining her husband's festival; she previously appeared at the 2013 fest. Other acts performing at the 2015 fest are A-Trak, Action Bronson, Fabolous, DJ Mustard, G-Eazy, Flatbush Zombies, Duke Dumont, Halsey and Ryan Hemsworth. Check out the Made in America site for the complete lineup. After two years in Philadelphia, the Made in America festival went bi-coastal in 2014, adding a Los Angeles event for the same weekend as the annual Philly get-together. However, the fest failed to have a similar impact on the West Coast as it does in the East and plans for a follow-up MIA LA fest were scrapped earlier this month. 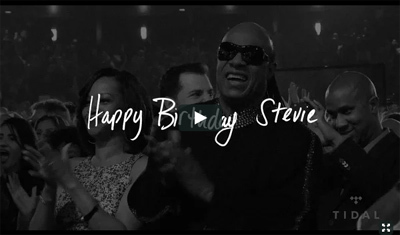 In celebration of Stevie Wonder's birthday, a behind the scenes video from Beyoncé's performance at the "Songs In The Key Of Life" Grammy tribute was uploaded to Tidal. "Stevie’s music resonates like none other. There’s no better way to honor him on his birthday than to share some of my favorite Stevie classics. Happy Birthday Stevie!" Beyonce, Kelly and Michelle's performance of "Say Yes" at the Stellar Awards is finally available in high quality. Watch below! Beyonce.com was also updated with photos from rehearsals. Beyonce, Kelly Rowland and Michelle Williams performed 'Say Yes' during the 30th Annual Stellar Awards at the Orleans Arena on March 28, 2015 in Las Vegas, Nevada. The song also won the award for Music Video of the Year! The performance will be aired on April 5 at 6p/5c on TV One. After the show, Beyonce was spotted with Jay-Z and Blue.